Hello Fashionistas! It's been a minute since my last post but I'm about to get back on it. Resolution: Be fabulous (always), and post more consistently. To get the the new year started off right I wanted to do a really quick makeup review. One of the major ways to always be fabulous is to make sure your face is beautiful, even if you only have 5 minutes. 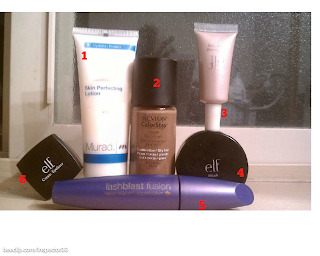 Below, I have my 6 go-to, everyday makeup products. You can find these products in many "department" stores or they are readily available online. They are also all pretty inexpensive and give major bang for your buck. It took me a long time of trial and error and friend recommendations to find these products so hopefully this will save you some legwork. I have sensitive, combination skin but most of the products can be used by anyone. **Notable Mention** Want a fast glam look OR don't have much time and want to look like you care, put on an red lipstick with a blue base. It will make your teeth look whiter and your mouth look gorgeous. I use Maybeline Super Stay 24 Color (everlasting wine) because it's the best longwear lipstick I've found. I keep it with me at all times. Of course there are other products that you can use, like facial primer, or eyeshadow, to get better performance out of these products or pump up your look but this is good fast, simple, effective regimen. It's a good place to start.